Hawker Fare alumni serve umbrella drinks with unusual interpretations of classic dishes. The pupu platter features a rotating selection of dishes, such as crab rangoon drip and grilled short ribs. The kitsch hits you before you even enter the door. That's because the door itself forces a sort of reckoning: Yes, you chose to go to a tiki bar for dinner, so naturally the handle is going to be a giant Polynesian-esque mask. Nothing about The Kon-Tiki, the three-month old downtown spot, is subtle. Birds sing on the speakers. 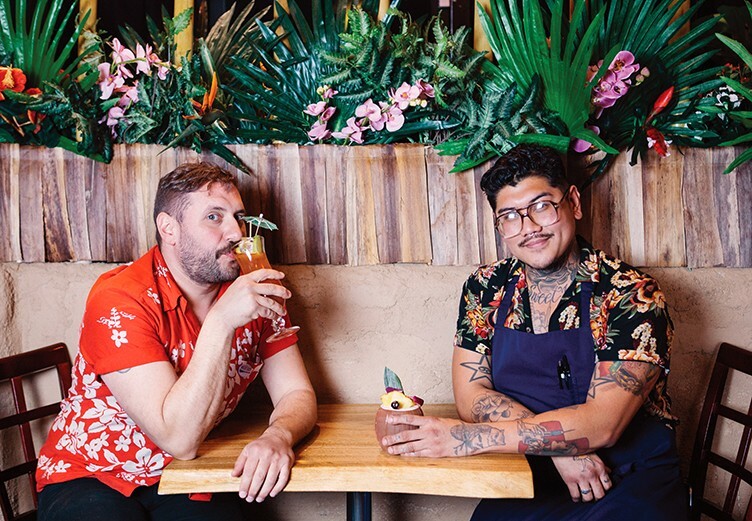 The servers — and owners Christ Aivaliotis and Matthew Reagan — wear cheesy Hawaiian shirts. Unapologetically fake plants abound. Despite the over-the-top silliness, The Kon-Tiki team is completely serious when it comes to the bar's food and drink. Aivaliotis' bartending résumé includes Oakland's Flora, San Francisco's Hawker Fare, and Hawker Fare's upstairs neighbor, Holy Mountain, which he helped open. Chef Manuel Bonilla was chef de cuisine at Hawker Fare Oakland and polished his skills during stints at Clove & Hoof and Homestead. As you'd expect, the drinks are excellent — strong and spirit-forward while still paying homage to the tiki canon. And if you like tiki bars, The Kon-Tiki's atmosphere definitely delivers. When Aivaliotis and Reagan took over Longitude, they inherited that tiki bar's decorations and added many more. More surprising is how The Kon-Tiki often feels more like a restaurant instead of a bar. 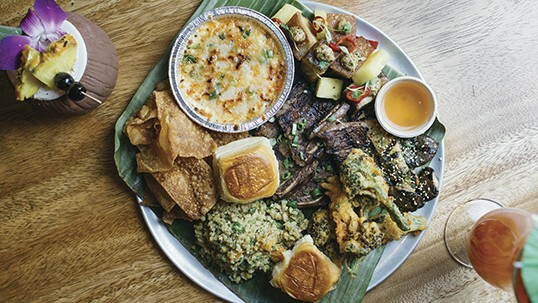 A lot of people are drawn to Bonilla's interpretation of tiki food. Most tiki bars serve food that's vaguely Hawaiian or Americanized Chinese, and more often than not, it's not very good. The Kon-Tiki makes bar food you'll actually want to eat — even completely sober — and it's available until last call. For dinner for two people, the pupu platter is a great option. These days, it's a finger food-style sampler of most of The Kon-Tiki's menu. In the future, Bonilla said he hopes to have more fun with the platter as a vehicle for seasonal specials. My favorite item was the most unexpected: the grilled King Trumpet mushrooms. Doused in miso brown butter and furikake, they're slightly sweet, smoky, and refreshing on an otherwise heavy menu. I also loved the spin on tiki classic crab rangoon. Instead of cream cheese-filled dumplings, Bonilla serves fried skins that you dig through a thick layer of broiled smoked cheddar to reach a creamy crab and shrimp dip. Like the decor, it's ridiculously over-the-top and fun. Owner Christ Aivaliotis sits with chef Manuel Bonilla — in Hawaiian shirts, of course. Bonilla nods to his Filipino heritage with the pork belly, another pupu highlight. He cooks it adobo-style with soy sauce, vinegar, garlic, and bay leaves before deep frying it until crispy. Chili vinegar on the side makes it one of the most intensely flavored and tangy dishes on the menu. Less exciting were the prawns. I appreciated that they were fried with the heads still intact, but they were a bit dry and bland. The grilled short ribs were fine but you can get much better renditions in many Korean restaurants in Oakland. The best part is that they come with macaroni salad, and this version is significantly tastier than the run-of-the-mill sides at Hawaiian fast food restaurants. Thanks to an abundance of scallions, the mac feels unusually fresh. The Kon-Tiki also serves a few sandwiches that don't make it onto the pupu platter, as they serve as a filling meal on their own. The burger is justifiably popular, with minimal frills: two nicely charred, thin beef patties and melted American cheese on a sesame seed bun. What makes it stand out as tiki-ish is the pineapple-onion jam and option to add Spam on top. Obviously, I ordered the Spam. I love Spam, but there is such a thing as too much Spam, and The Kon-Tiki's proportions could use adjusting. The slices of Spam were almost as thick as the beef patties, adding softness instead of a desired crispy layer and also drowning out the sweetness of the onion jam. The oyster roll needs some tweaking as well. Topped with a chicory slaw, the sandwich offers lovely briny flavors. But buried beneath dill cream and Japanese mayo, it was impossible to detect any crunch from the cornmeal-crusted, deep-fried oysters. Supposedly there was chili oil on those oysters, too, but I couldn't taste any. It would have been a welcomed addition to cut through the creaminess. Out of the sandwiches, the fried chicken is the best. It gets brined in green curry and buttermilk before crisping up in the fryer. The chicken maintains its aromatics, which are heightened by a green papaya slaw and fermented chilis. The result is a slow burning heat that feels great chased with a creamy cocktail — and the dish that truly showcases Bonilla's Hawker Fare chops. Vegetarians don't have too many options here, although Bonilla recently added an impressive beet dip to join the mushrooms. Blended with Greek yogurt, the red beets get a nice tang and creamy consistency, topped with toasted hazelnuts and cubes of gold beets for extra texture. The earthy, well-spiced flavors work well spooned over soft Acme bread, though they don't particularly scream "tiki" on an otherwise cohesive menu. Hours: Tue.–Wed. 5:30 p.m.–midnight; Thu.–Sat. 5:30 p.m.–1 a.m.